Louisiana Injury Lawyer | Baton Rouge Accident Attorney | Dué Guidry Piedrahita Andrews L.C. Contact Baton Rouge Accident Attorney Dué Guidry Piedrahita Andrews L.C. Specializing in complex and serious Personal Injury and Wrongful Death litigation, Dué Guidry Piedrahita Andrews L.C. enjoys a prestigious AV Peer Review Rating from Martindale-Hubbell, thus signifying the highest legal ability and ethical standards. Member lawyers Kirk A. Guidry and B. Scott Andrews have also been selected by their peers for inclusion in Best Lawyers in America©, Louisiana Super Lawyers, and The National Trial Lawyers Top 100. Dué Guidry Piedrahita Andrews L.C. is also recognized in the prestigious 2018 U.S. News -Best Lawyers "Best Law Firms" rankings in the Plaintiff practice areas of Personal Injury Litigation and Product Liability Litigation. 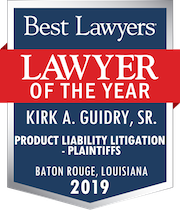 Kirk A. Guidry was additionally recognized by Best Lawyers in America© as Baton Rouge's 2019 Lawyer of the Year in the Practice Area of Product Liability Litigation. The reason our injury lawyers have been recognized by leading legal peer review organizations such as Best Lawyers®, Best Law Firms® and Super Lawyers is clear - extensive experience handling referrals of complex and difficult personal injury and wrongful death cases from lawyers around the world. Our law firm's success is rooted in academia with three attorneys having graduated #1 in their law school class. We also boast an Adjunct Professor of Law, a past President of the Louisiana Association for Justice emeritus, and a former 19th Judicial District Court and First Circuit Court of Appeal judge of counsel. The experienced attorneys at Dué Guidry Piedrahita Andrews L.C. combine their academic backgrounds, practical trial experience and financial "staying power" to add up to success for injured clients and the lawyers trusting the firm with referrals. Depending on the nature of the injury and damages sustained, the hiring of a personal injury attorney can be one of the most important decisions in a person's life and can have long-lasting and life-altering consequences. The decision should be based on thoughtful and thorough consideration of all relevant factors, including the attorney's reputation, legal ability, success rate, personality and commitment to provide the client with quality and ethical legal representation. The decision should not be made on advertising alone. The foundation of our Personal Injury and Wrongful Death legal practice is our commitment to professionalism, ethics and hard work. We care about what we do, we care about the people we represent, and we care about obtaining full justice. Our Louisiana injury attorneys can handle your serious personal injury or wrongful death case on a contingency fee basis (meaning no fee will be charged in the absence of a recovery) and we can advance the necessary litigation costs and expenses. If a recovery is obtained, you will be liable for any costs and expenses in addition to the contingency fee. Best Law Firms – Baton Rouge, Louisiana – Best Lawyers® Dué Guidry Piedrahita Andrews L.C. 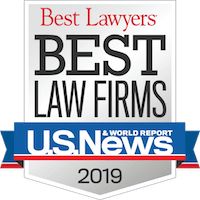 is proud to announce its recognition in the prestigious 2019 U.S. News –Best Lawyers "Best Law Firms"